I recall, from the days I used to be SV1DKL living in Athens, frequently passing by the National Road to Thessaloniki at Ag. Stefanos suburb and staring at the 886ft. high pylon of the Greek National Radio broadcaster, my mind working around all kinds of antenna use for it for the TopBand. Rhodes, 2016 ... December ... I've been an SV5 for 13 years ... 160m is in good shape, but from my home QTH it's not easy to work it properly without right infrastructure, space, height, RX antennas and proper counterpoises. During one of my drives around the city, I notice the installations of ERA Rhodes, at the city limits, right next to the sea shore. I stopped for a while to have a look at the inactive MW installation. 2017 CQ 160m WW SSB contest was really close (last weekend of Feb. 2017), but with my home QTH available systems, I had no real intention of participating. However, in front of me, I now had an ideal, commercial, not in operation antenna system, which other than that, seemed to be absolutely operable. Thousands of thoughts crossed my mind in milliseconds. 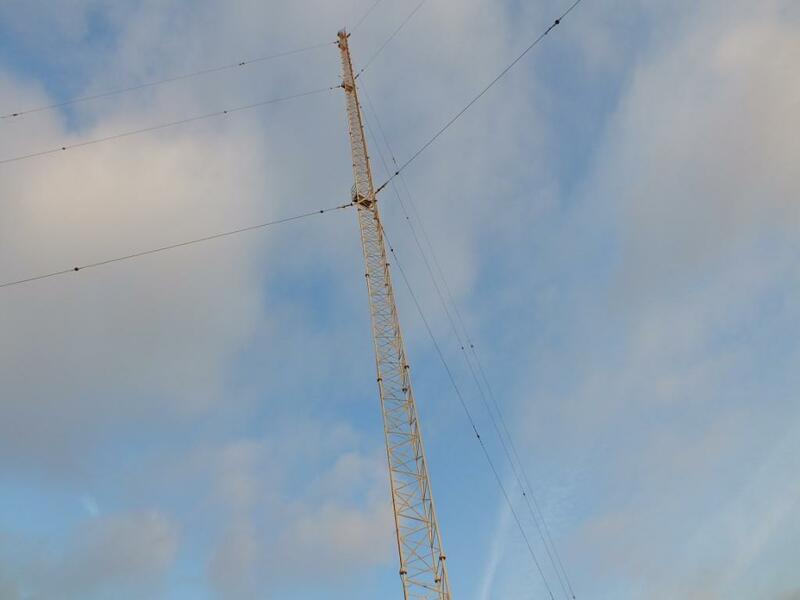 There just had to be someone to get me in contact with the persons in charge of this radio station, and apply for the use of the antenna system itself, for the specific weekend. It happened exactly like that!! 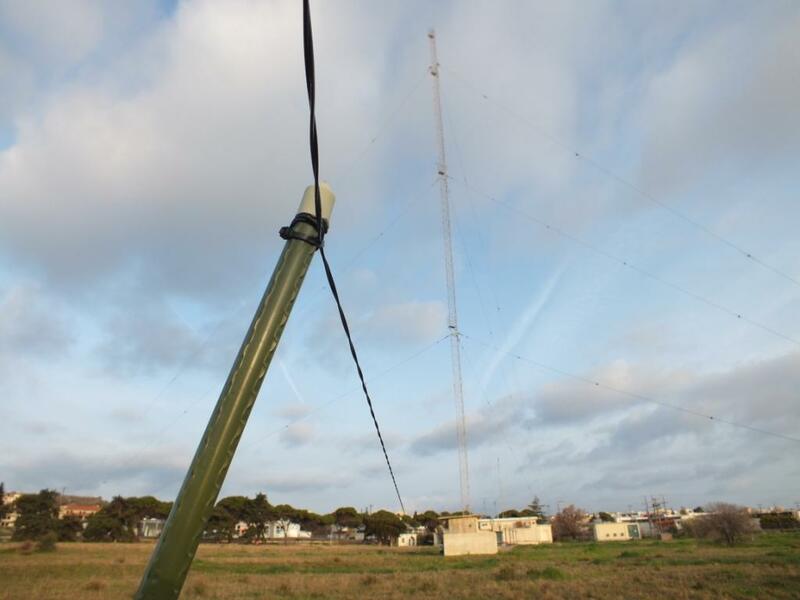 Thanks to my good friend and colleague Panos, SV5AZΚ, I was brought in contact with the director of the station and quickly discussed what we would like to do with the TX antenna tower of ERA Rhodes, on the amateur radio band of 160m. The initially negative reaction, due to safety, interference and legality reasons, etc., was quickly transformed into acceptance, with particular warmth, especially after the approval we got from the General Director of ERT's Technical Services. After we defined the dates of first researching visit to the installation, first test transmission, shack setup and participation in the contest, we applied for our special call, SX5R. Next step ... operators. It was obvious that at least one more operator was necessary in order to pull off the project properly. Among the list of Greek contesters, I knew that only 2 or 3 would be immediately willing to accept travelling to Rhodes for our project. The first one I approached, after listening carefully to what the plan was, accepted to join with me and share the project with great elan. 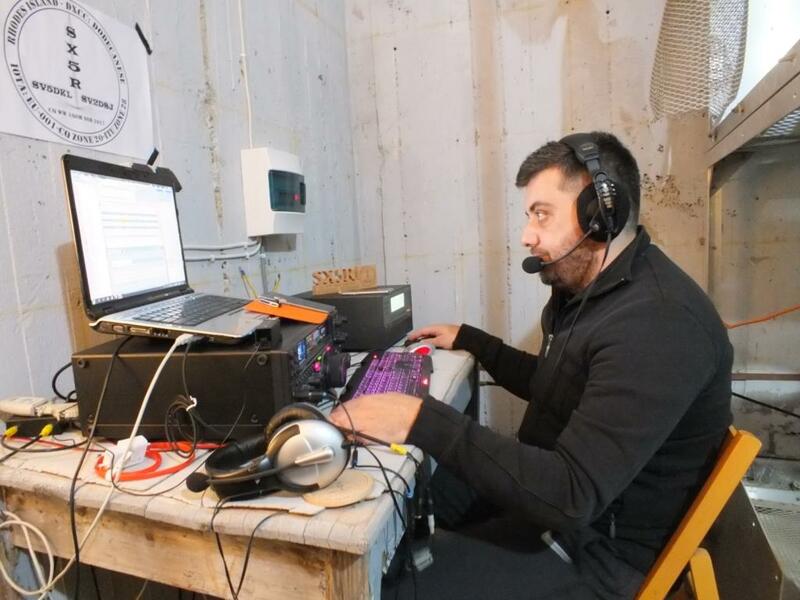 So, Panagiotis, SV2DSJ, would be the 2nd op of the team and that made me really happy, as Panagiotis, besides a very promising contester, proved also to be a great CW operator, to which I am really addicted. Unfortunately, approval to use the installations restricted us to a maximum number of two operators, so there was no further chance to invite anyone else. After travel and accommodation arrangements for Panagiotis, we moved to the next step, of designing the setup to be used. The property of ERA Rhodes resides just 50m off the sea, has a formed sub-ground with a carefully selected counterpoise system and is like a square, measuring 443ft x 558ft. The antenna tower is 275.6 ft. high (84m) and is located at the center of the property. 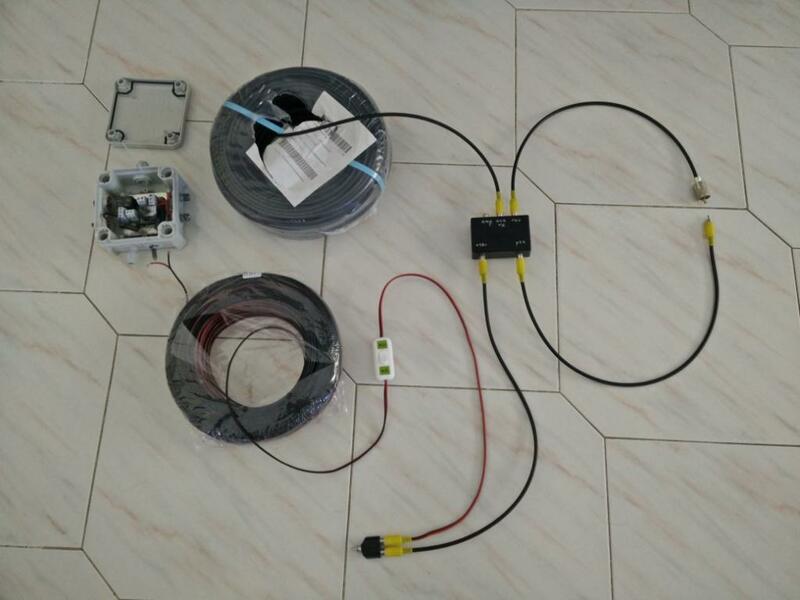 The antenna is ground-isolated and equipped with surge-arresters and air/navi lighting, which is powered inductively to keep it galvanically isolated. The imminent need to install RX antennas for the TopBand, kept us busy reading for a few days, concluding that the best solution, in terms of effectiveness and ease of installing/uninstalling was building two non-terminated 1λ beverages, one to EU/NA/Indian Ocean and one to AS/JA/SA. Although we missed some crucial parts to construct the necessary adjusting circuits, my good friend George, SV1ELF, sent us at his expense and good will, everything that was required plus more. The room that was allowed to us to set up our shack was the actual antenna tower coupling unit room, just 10 feet away from the antenna tower base and our feed point!!! The room was equipped with electric power and lighting. Copper bar of 40x6mm, to which we grounded everything, ran around the whole internal perimeter of the room and was connected at many points with the foundation's vertical risers, and were also connected to the external sub-ground grounding system of the Radio Station. Shack equipment was a Yaesu FT-2000, a MOSFET kW amp (SPE Expert 1K-FA), a high power manual antenna tuner (>3,5 kW) for tuning the TX antenna tower, laptop, footswitch, headsets etc. Thurday, 23/Feb/2017 by the afternoon the 2 beverages were installed, with SV1ELF's matching transformers, groundings, control cables and all coaxes. Antenna analyzer measurements were really optimistic. The beverage to 320 degrees was 607 ft. long and the other one to 40 degrees was 525 ft. long, both travelling at 6 ft. high from physical ground. Friday, 24/Feb/2017 in the afternoon SV2DSJ arrives, we immediately get to ERA Rhodes and start setting up the equipment. In no time, we get on-air, with the transmitting antenna tower having been tuned fine with very good bandwidth, through the manual antenna tuner. The Beverage RX antennas were working with superb directivity and quiet reception. R9MJ was a typical RX example, who was received with s9 at the Asiatic beverage, while he was not even heard at the European one!! SV2DSJ started off with a bit of CW on 160 meters as SV5/SV2DSJ and all received signals were really strong on our receiver. After some rest and evening dinner, the contest began. SV5 (Dodecanese) is very rare on 160 meters, since there's very few activity, which resulted to infinite callers. Countries that I had never copied from my home QTH, were coming in with s9 signals from this site … C6, 6Y, ZF, etc. called us on our frequency. The 1st night rolled out very well and by the first morning we had made 238 contacts. We disassembled the shack, loaded everything in the car and got some rest by the afternoon. Our "temporary" shack had to be disassembled each morning and reassembled each afternoon, due to theft danger from nearby camps. What was only left back were the RX antennas and their connecting cables. The 2nd night rolled likewise well with good traffic, and by the 2nd morning we had reached 445 QSO, including enough dupes. Then, the usual, ripping apart the shack, resting, putting everything together again and off to the last night of the contest! We finished the contest with a total of 524 QSOs, 12 CQ Zones & 53 DXCC, summing up to 144,045 points and 29 dupes. Right after the end of 160m CQ WW, we tuned the TX antenna tower to CW portion of 80m, in turns with SV2DSJ, we managed to make by the morning (in just 5 hours) as many QSOs as we had achieved in the contest, with great DX QSOs in the log (given the opportunity!!). Final shack and antenna disassembly was performed in just 40 minutes, leaving the surrounding area exactly as we found it at first. Monday was a national holiday in Greece, so, after unloading all of the equipment at my place, we set off with SV2DSJ and my family to enjoy some nice sea views with great seafood. 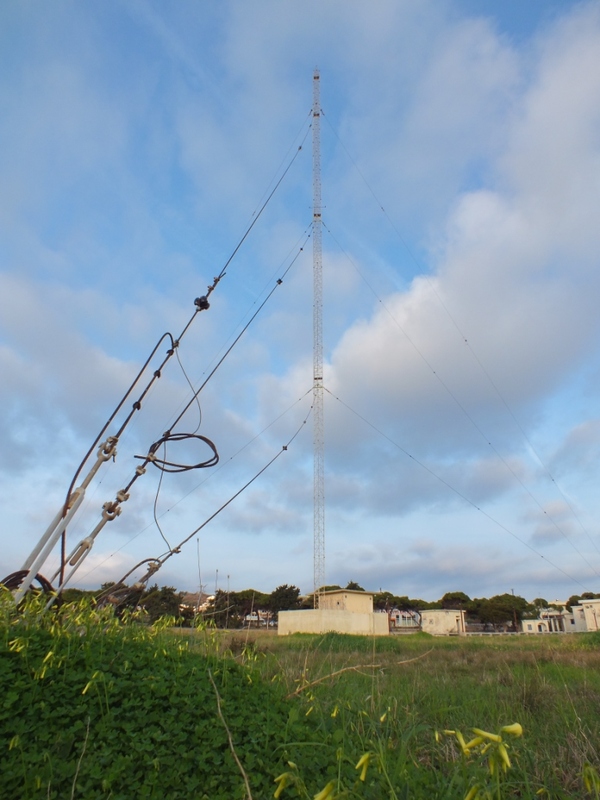 This was a unique experience for both of us, having the chance to use a commercial antenna installation for MW to 160m, especially with our participation in the 160m CQ WW SSB and from the specific location by the sea. There are obvious differences to a plain amateur radio installation, I'd say these are vast. Of course, this doesn't necessarily mean that an amateur radio installation should be of inferior performance, on the contrary, there are fellow ham's installations that have nothing to envy from respective commercial ones. The main difference has to do with the over dimensioning of materials, equipment and accessories, especially since the power levels used in commercial radio stations are usually three figure kW ones!! It is certain, however, that abandoned or, not in operation MW radio stations, are accessible and can be maintained, exploited and even developed by hams, in similar contests/events, instead of ending up in a scrap yard, as is usually done. Our experience shows that even at a National Radio Broadcaster, like Greece's ERT (or ERA), there's an easy approach and understanding from the other side, both in technical and in practical terms. Don't be afraid to apply for use of an abandoned or not in use, installation; it is certain that there's nothing for you to lose. From my side, I'd like to particularly thank Panagiotis Kavvalakis, SV5AZK, because without his intervention and support, nothing of the above would have taken place, Athanasios Samaras of ERA Rhodes and the rest of the radio station's staff for bearing with us, and for their support and hospitality, the General Director of ERT's Technical Services for approving our application to use the infrastructure and installations of ERA Rhodes, Panagiotis Violistis, SV2DSJ, who travelled across all Greece to be part of this project, and George Sofronas, SV1ELF, who shared his precious advice and knowledge, and fed us with required hardware for beverage RX antennas implementation. All photographic material accompanying the present article is published under the courtesy and with the permission of ERT S.A.